This Raised Bed is planned to give 3 Batches of Vegetables during one season. The picture above shows the layout of second batch. Carrots and Onions traditionally thrive together. 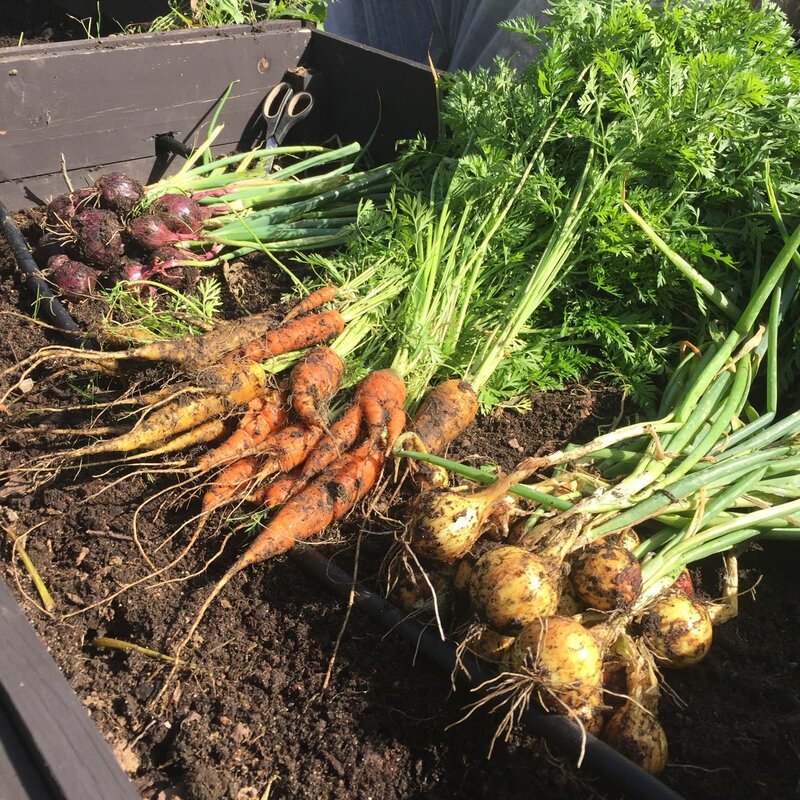 The smell of Onions keeps the Carrot Bugs away, and they compliment each other since Carrot roots grow deep and Onion roots grow wide. Sowing Carrots and Planting Onions at the same times enables me to grow something before, and something after these Crops. I will try to do an early batch of Carrots to eat fresh for the first Batch. For the third Batch I will focus on Mache Salad since it's cold resistant and very tasty. 3c = This bed is in the "Needs Less" Quarter in my Crop Rotation Plan. Winter Sow Carrots (select a variety good for early Winter Sowing). For more info on Winter Sowing, see this post from last winter: Winter Sowing. Winter Sow Radish. I place mine in the middle of the bed (where I will plant the Onions later), since I'm sure that I will pick all the radish before it's time to plant the Onion Bulbs. Cover the Bed with Organic Material like Leaves and/or Grass Clippings and let it rest over the winter. I continued my Winter Sowing today, and got to this Raised Bed. I'm Winter Sowing Carrots and Radish according to the plan. I'm not writing detailed instructions for every Raised Bed that I'm Winter Sowing. See this post for more detailed instruction on How to Winter Sow: Winter Sowing in Raised Beds. Radish is the first thing to sprout in this Raised Bed. Seems like I got the rows fairly straight..
Radish are looking good outdoors. It seems like I got the rows fairly straight at sowing. Oh no! Radish is not doing to good in this raised bed. Temperatures have been unpredictable. -7 degrees celsius during the night, and really really hot in the raised beds during daytime. Obviously these radishes did not cope... Well well.. I have more radishes coming in other raised beds. But still sad to see. Oh sorry to see.. They were doing so well.. From my packets of seeds it says to sow the seeds as soon as soil is workable for lettuce and radishes... So I'm sure if you sow them without a cover they should be fine.. They don't mind some cold temps.. I think spinach too if I remember correctly..
Luckily I do have more Radish in other areas, so we're not without. They probably would have been better without cover as you say. Spinach is doing really well so far even though spring weather has been very cold and unpredictable. Carrot seeds and Seed Onions are started for this Raised Bed. Quick update on the Onions and Carrots. Sanna wrote: Funny looking carrots! I pulled one from my garden too.. And it looks just as weird.. Lol why is that? I'm not sure why really.. I kind of like them and have not made any effort to fix it. Does anyone else know? Nice harvest of yellow onions and carrots today!